December 16, 2016, 8:13 a.m.
Brexit has exposed what may be the defining political divide of the next few decades. The issues surrounding the UK’s withdrawal from the European Union are drastically altering the political landscape. The Remain and Leave camps could well end up being the spiritual parents of Britain’s future political parties or groupings. Work has already been done to discover what motivated both sides to vote the way they did, most notably by the British Election Study. But given that the two camps are already at war, new YouGov research has now looked at what Leave and Remain voters think motivates their rivals. One of the key strands of the Remain campaign was the so-called ‘Project Fear’, the Remainers’ attempt to encourage people to stay by highlighting the negative effects that Brexit would have on jobs, the economy and national security. 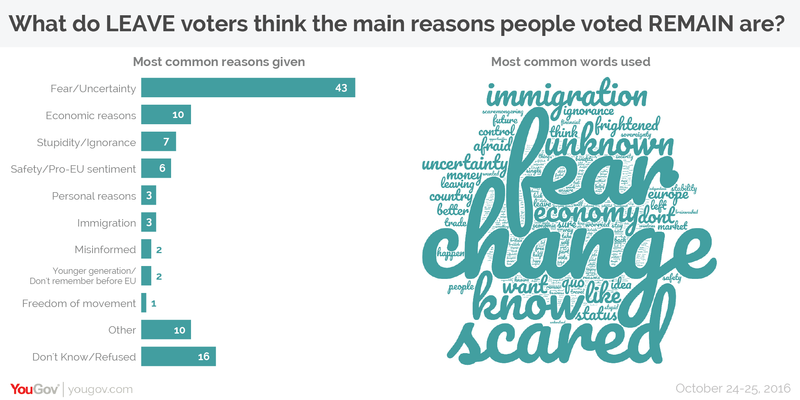 The extent to which Project Fear influenced the public’s voting decision will never be known, but it is clear that Leave voters believe fear was the main motivation for Remain voters. As many as 43% of Leave voters believe that Remain voters wanted to stay in the EU because of a fear of change and uncertainty – a far greater number than any other factor. Just 10% of Leave voters said that they thought economic considerations were a key reason why people voted to Remain in the EU. (It is possible that when some Leave voters said “fear” they meant fear of economic consequences – only a few were completely specific that the fear was connected to the economy). When it comes to Remain voters, they are equally clear on Leave voters’ main voting motivation: immigration. 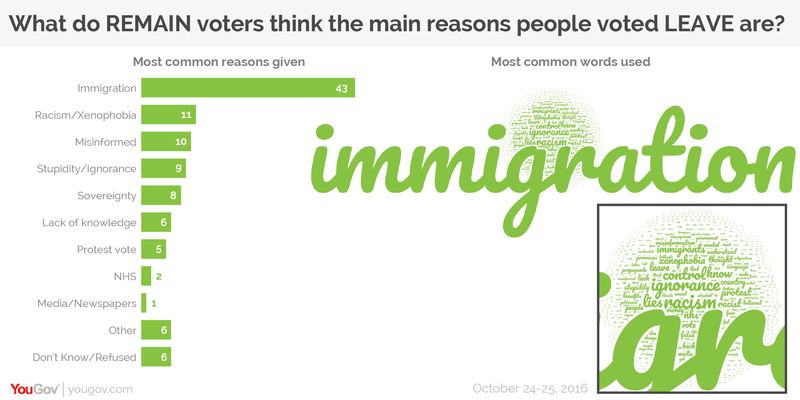 Mirroring the Leave voters’ results, 43% of Remain voters said they thought that immigration was one of the main reasons people voted for Brexit, and again this was overwhelmingly the number one reason given. By contrast, just 8% said that they thought sovereignty ­– taking back control – was a key motivator. Whilst the two studies use different wording and methodologies and are therefore not directly comparable, it is interesting to see how far the answers given by voters in the British Election Study are at odds with their opponent’s perceptions in our research. The BES study suggests that Leave voters were relatively evenly split between sovereignty and immigration in their June vote (a Lord Ashcroft poll also suggested sovereignty was the top motivation). Likewise Remain voters suggested in the BES study that they voted to stay on the basis of economic considerations. (We should, however, warn that experience shows people are not necessarily particularly good judges of their own motivations for doing something, and there is no reason to suggest they are any better at judging other peoples’ motivations). The survey also reveals the extent of the enmity the two referendum tribes have for one another. About 9% of Remain voters believe that Leave voters are stupid or ignorant – 7% of Leave voters return the favour. Additionally, 11% of Remain voters think that Leave voters made their decision based on racist or xenophobic intentions, making it their second most commonly suspected voting motivation. Young Remainers are especially likely to consider this to be the case, with 23% giving this answer. Remain voters are also more likely to question the basis on which their opponents made their decision to vote. About 10% of Remainers thought that Leave voters were misinformed (i.e. that they had bought the Leave campaign’s ‘lies’, or were somehow otherwise wrong in their grasp of the facts). By contrast, just 2% of Leave voters said the same of Remain voters. On top of this, 6% of Remain voters speculated that Leave voters were poorly informed, and that this was a key factor in their decision to vote for Brexit.